So a couple of weekends ago I saw a hummingbird. This is important because I am fast approaching a new decade and it is the first hummingbird I have ever seen in my life. Yes people, this urban raised girl has never seen a hummingbird before. I had heard of them and really thought they weren’t in Jersey but lo and behold one of those mystical little creatures was loving my orange cosmos. Now we’re inspired to plant a hummingbird garden next year. So what exactly do hummingbirds look for? According to Defenders of Wildlife “They primarily eat flower nectar, tree sap, insects and pollen.” I’ve also heard they are attracted to red flowers, that’s why so many hummingbird feeders have red in and on them. The red can be obtained from various sources including sugar water with food coloring… YUCK. Our approach will be to plant flowers that will attract the hummingbirds – we’re doing it the good old fashion way. So what are these hummingbird attracting flowers? Well right off the bat I would say the cosmos are a winner, they didn’t bloom until late July and are much bigger than I expected but they got us two birdies (I missed the second one, or the first one coming back for more). 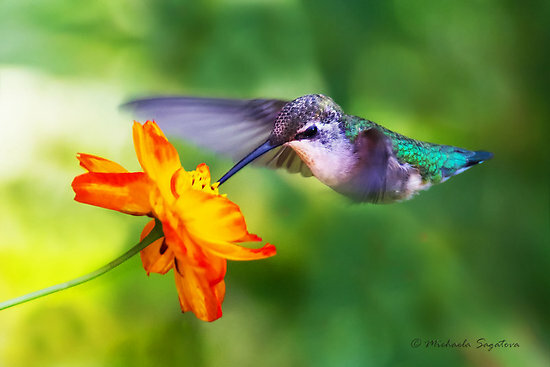 You will notice that my cosmos aren’t on this list – this goes to show that there are lots and lots of flowers out there that can make a nice hummingbird playground. I wouldn’t mind a nice patch of cosmos, fuchsia, impatients, mimosas, petunias, salvia and jacobiana. I’ll have to see the bloom rates to make sure we have something going from spring into fall. After soaking the grains overnight rinse and discard water. In a good pot heat coconut oil and add the spices through to the sesame seeds. Let them cook for a few minutes and then add the garlic, onion or shallots and ginger, let them cook for a few minutes. Add the grains and incorporate them well into the spice mixture, let them cook for about 3 minutes to get a nice spice coating. Then add the remaining 3 cups of water, the mushrooms, the bay leaf and salt or kombu. Bring to a boil and then simmer on low for 30 – 45 min depending on how soft you like your grains. I also use this same recipe to make brown rice and different beans. Feel free to play around with the spice combos too.